This week's challenge: Ready to tackle a classic dish from another culture? Pick an ethnic classic that is outside your comfort zone or are not as familiar with. Try to keep the dish as authentic as the real deal. Christey and I were married in the Tampa Bay area, and one of our favorite restaurants out there is The Pearl. Chef Karim is from Morocco and blends North African and Mediterranean cooking in really fun ways. I love blending cultures in a meal. Caribbean with African, Asian with French. Oddly, I've never attempted anything Moroccan before, so I was inspired by this challenge to give it a try for the first time. Morocco itself has always been a cultural melting pot with its strategic location at the entrance of the Mediterranean. Local Berbers have mixed with Arab settlers, Spanish and Portuguese expatriates, Sephardic Jewish refugees, and the influence of much of Europe through war and colonialism. Each of these groups brought their own cuisines and blended them with local ingredients. On top of the cultural differences, each individual family has their version of classic dishes, so "authentic Moroccan" is something of a moving target. Tagine is one of the most commonly known Moroccan (and North African) methods of cooking, usually referring to the conical cooking pot, but also referring to the style of the meal. The type of tagine I chose to cook is the m'qualli, which typically involves oil, saffron, and lemons, though the other ingredients vary widely. It's similar to chili in Texas -- meat and tomatoes form the base but everyone has their own recipe with additional ingredients, usually following family lines. For the protein, m'qualli is typically chicken, but may also use lamb or beef or goat or fish. Living in Florida, I definitely wanted to make a seafood version, which typically uses whole fish. I chose to use whole local yellowtail snapper for freshness reasons. Snapper mouths expand to quickly snap up their prey. My snapper came gutted, but it still had scales and the gills. The gills leave a bitter taste when cooked, so it's necessary to cut them out either by hand, or with kitchen shears. The scales are inedible, and I happen to have a fish scaler (I'm an avid fisherman), but a spoon or a steak knife also works to scrape off the scales. Your fishmonger may also scale and gill the fish if you ask. The result is similar to a chimichurri, or a loose pesto. Very herby, but infused with spices. I happen to have bought a tagine for this challenge (and I'll surely be using it for many, many meals in the future), but a ceramic roasting pan or a wide cast iron skillet may also be used, with a tent of foil to catch the steam. I placed the fish in the bottom of the tagine, and covered it with the chermoula. I made a series of slices thorough the skin, which helps the chermoula infuse the meat, but also helps the fish keep its shape. Snapper skin tends to shrink when cooked, and this sometimes causes the fish to curl in unpredictable ways. 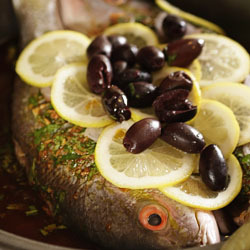 Once the snapper is covered with the chermoula, it's typically covered with onion slices, lemons, and olives. Once again, I used what I had on hand, which was shallots, and kalamata black olives. Many recipes also add water or stock, so I added some homemade chicken stock to help the fish cook. This type of cooking is essentially a braise, and a bit of liquid helps steam and braise the fish. The oven was preheated to 400 degrees, and the fish was baked for about 30-40 minutes. The smell was so absolutely amazing at this point. I think everyone in the house knew it was done! Half of each fish was gently lifted from the bones (it fell right off) and added to a plate with warm couscous. Olives from the tagine were added, and the sauce from the bottom was spooned over the fish and the couscous. We served the fish with crisp, tart white wine from Spain. This turned out really nice. The fish was so tender, and the sauce was really complex. The cilantro was herby, but balanced by the acid of the lemon and the almost duskiness of the spices. Four cloves of garlic sounds like a lot, but the garlic was almost roasted after 40 minutes in the tagine and was really mellow.